News broke last night that Yahoo, a multinational technology company best known for its pioneering search engine, had been hacked in 2014 and over 500 million Yahoo users’ data were stolen. The data includes names, email addresses, phone numbers, birthdays, encrypted and unencrypted security questions and answers. The hackers are reportedly selling the stolen data on the dark web for 3 bitcoins (around £1,800). What’s really astonishing is that the hackers appear to have got in and out without Yahoo even knowing a thing! Yahoo’s security systems will have to be investigated and no doubt there will be users who will question which provider they can trust with their personal data. Click here to see a report on the case by the BBC. The hack serves as a reminder to us all of the growing risk to cybercrime and how precautious data controllers need to be with the security of any personal data which they are responsible for. 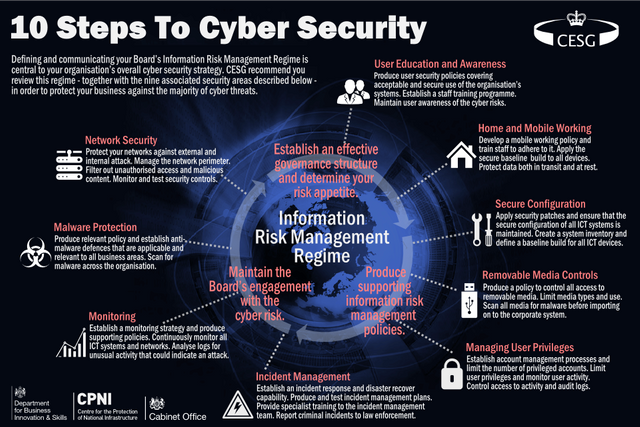 We strongly recommend taking a look at these 10 Steps To Cyber Security published by the Cabinet Office earlier this year (see picture)… They are well worth the read. We have a team of experienced lawyers who will be able to assist you, if you find yourself in need of friendly and clear legal assistance on any data protection or cyber issue. To find out more, or if you’d like a quote give us a call on 0345 351 0025 and we can talk you through your options.